ollywood starlets are treated to makeovers all the time. 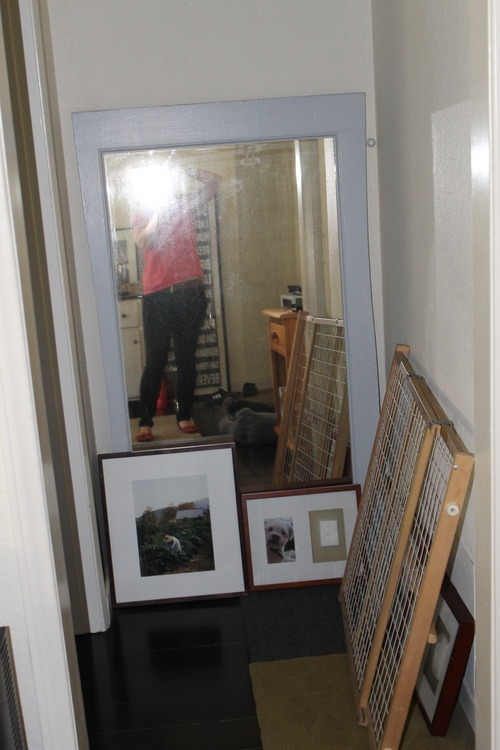 But what about Hollywood rooms? That’s right. It’s time for rooms to get the pampering royal treatment, just like their human counterparts. 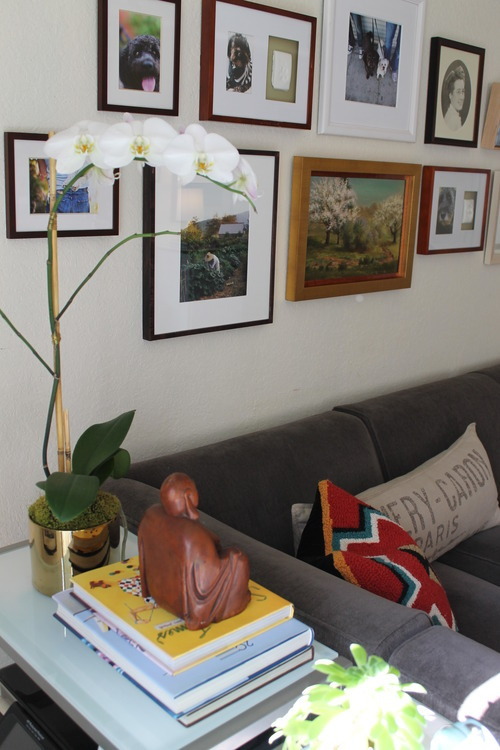 We recently made over a room in a Hollywood apartment for discerning clients: a couple with eclectic taste and fabulous personal style, evident in their collection of art, graphics, books, furniture and oddities. We spent a day pulling all these elements together to create a personal space that speaks to them, and includes so many of the unique items they’ve collected. 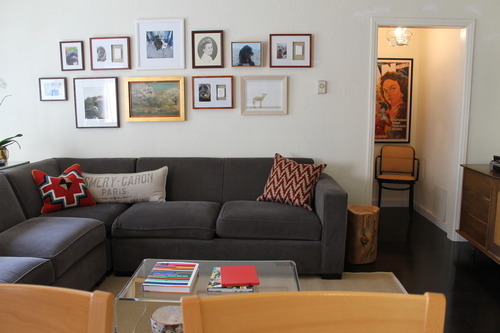 Here’s how we did it: In the living room, we added some West Elm pillows, a sisal rug from IKEA, a Peekaboo acrylic table from CB2, and a gallery wall made up of personal photos of beloved pets, family members and memorable vacations. 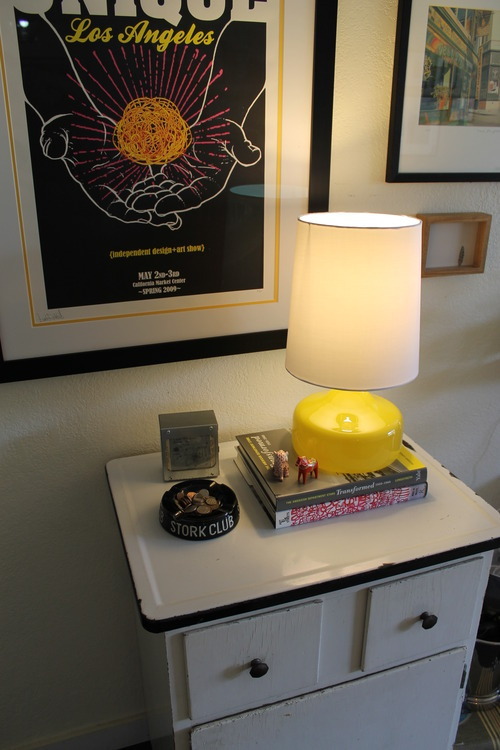 We used the curated collectibles already in the home. The couple had purchased the Pendleton pillow with the bold red Navajo pattern in Portland recently, and already owned the grainsack bolster pillow and global wooden carvings. 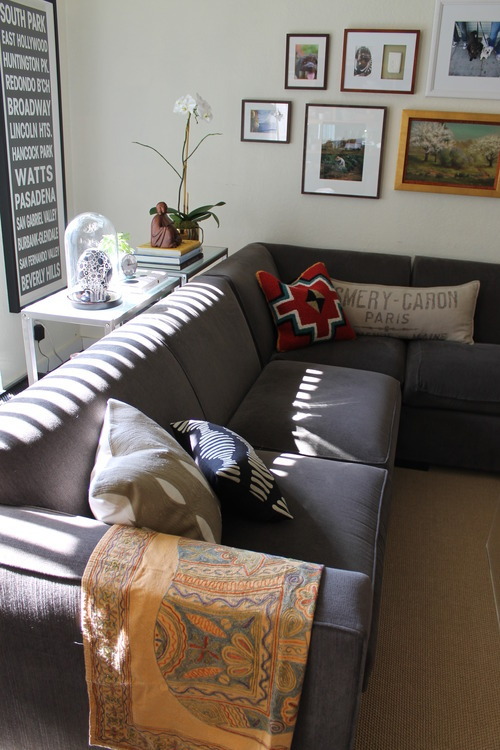 The red and gray West Elm chevron pillow tied in perfectly. 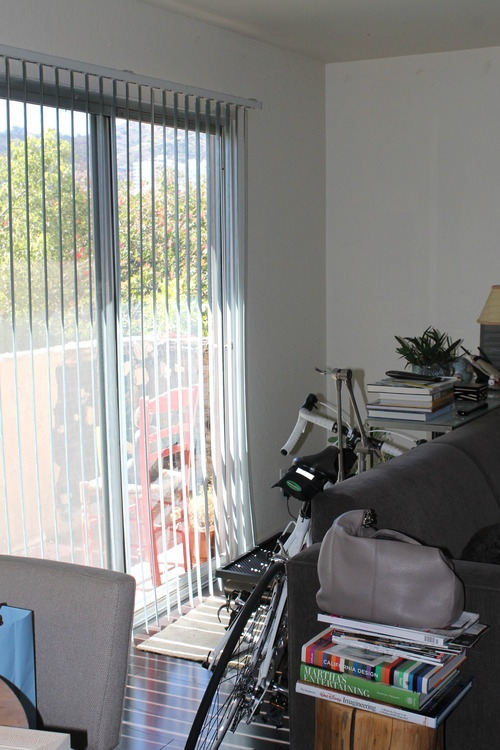 To the right, a Mid Century modern credenza we suggested the couple buy on craigslist turned out to be the ideal piece to anchor the TV screen. They already owned the Bollywood poster we hung in the hallway. We brought in the bentwood chair from their bedroom. 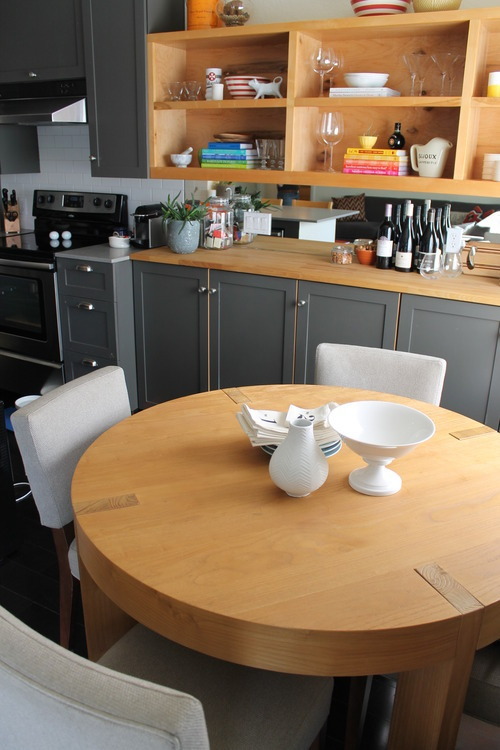 A West Elm pendant sheds light from above. 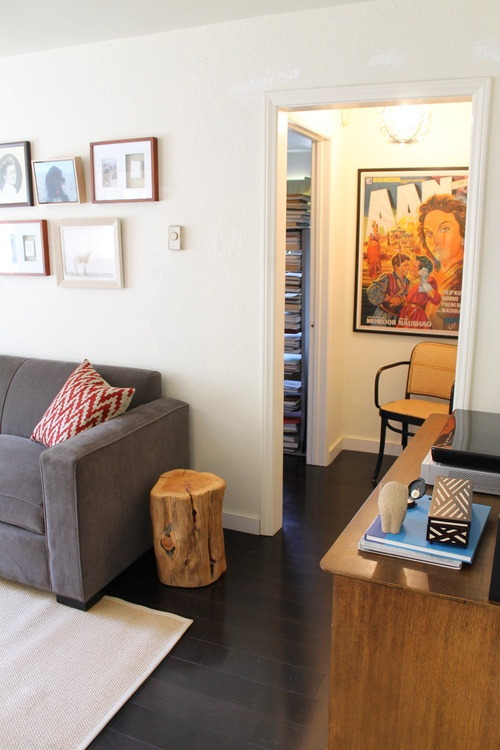 The tree stump side table adds a rustic element. The couple owns a couple of rescue dogs who like to play in the living room with their owners. 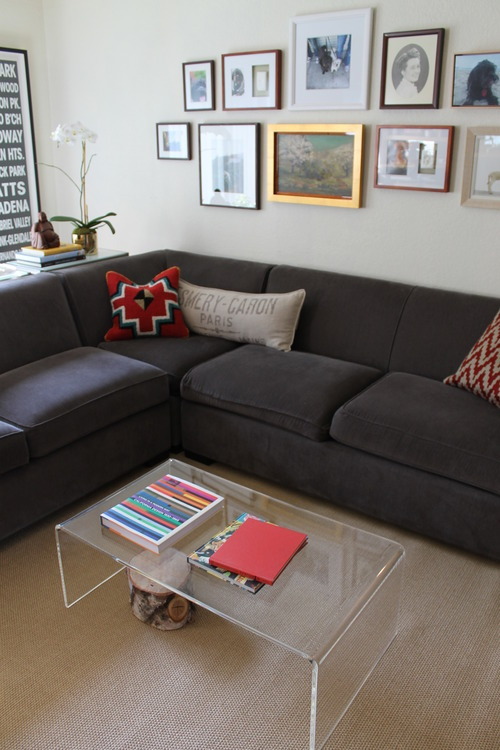 We suggested a lightweight acrylic cocktail table that can easily be pushed to the side when it’s playtime. 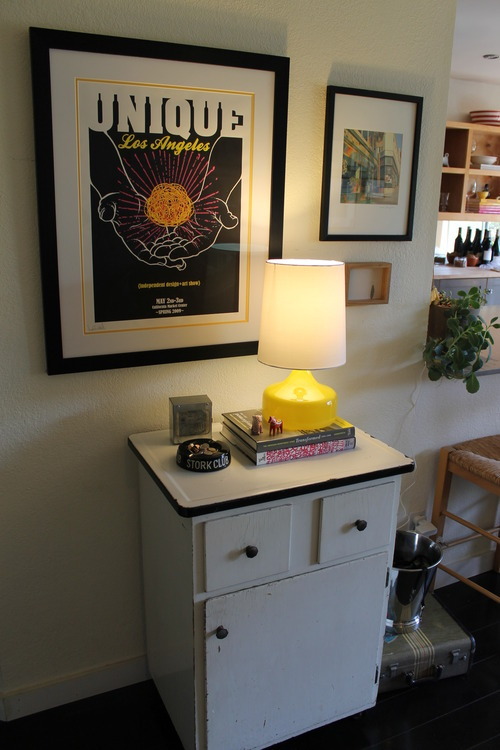 Near the front door, a vintage medical cabinet sits beneath a framed poster and two unique collected art pieces. 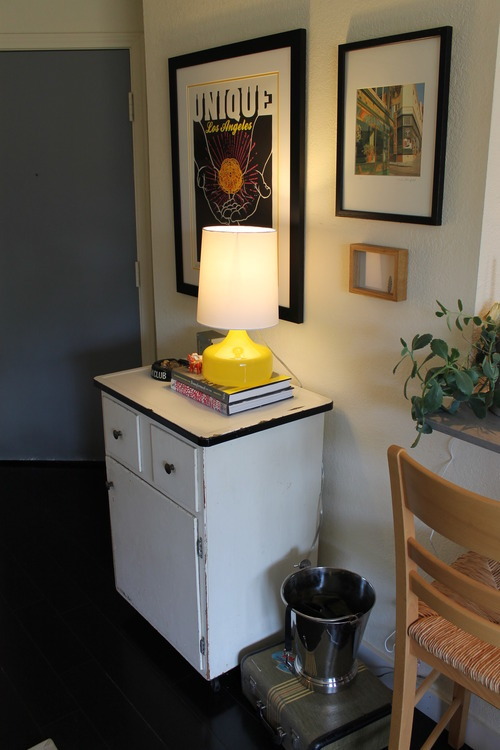 West Elm’s Perch lamp in bright yellow is a just-right height atop a stack of books. 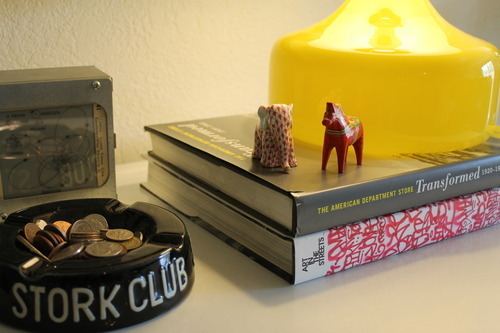 We love the vintage Stork Club ashtray for holding spare change. 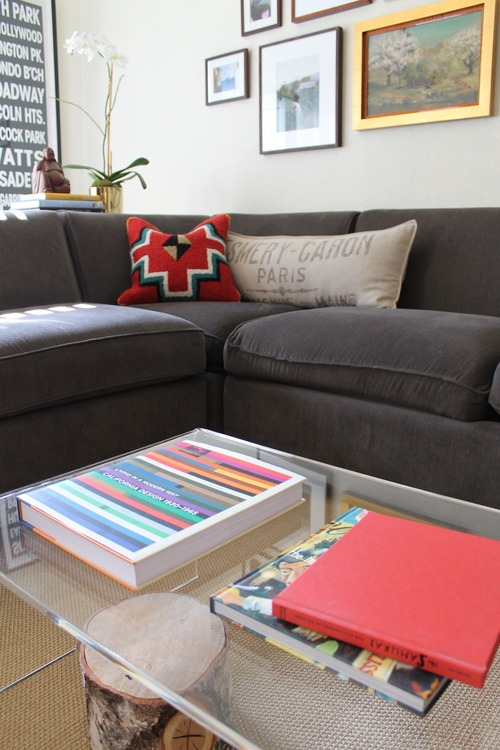 The couple’s awesome coffee table book collection was a joy to work with. 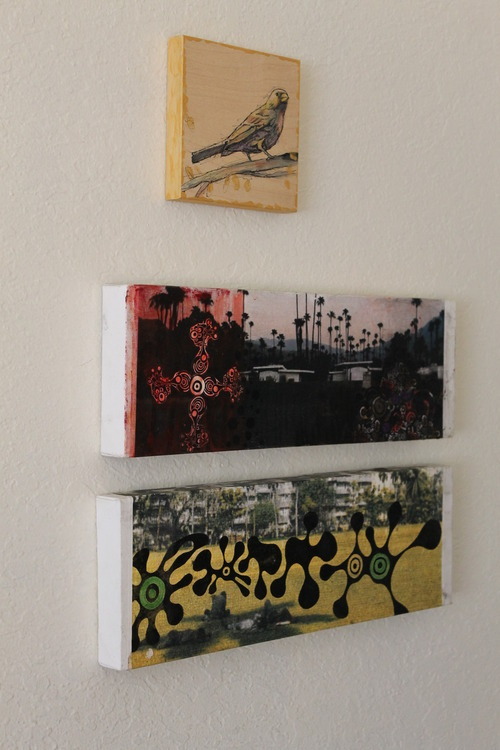 Two pieces of original art by one of the homeowners and a small bird illustration hang near the front door. 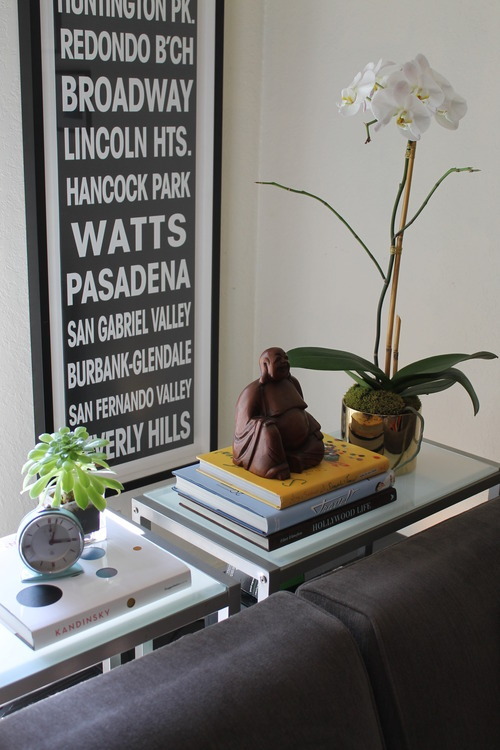 We had the most amazing collection of art to work with in this makeover. It made our job so easy! 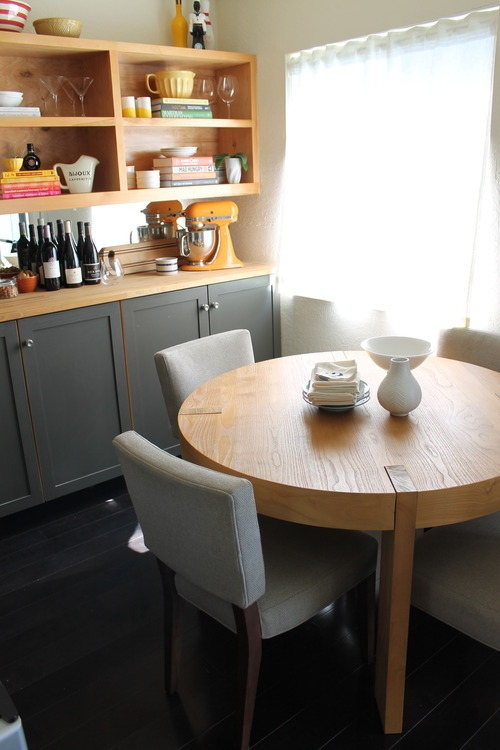 The dining room’s round table and upholstered chairs make for a cozy spot to nosh and view the custom wood cabinetry, which we styled using the couple’s enviable cookbook collection and other unique kitchen paraphernalia. 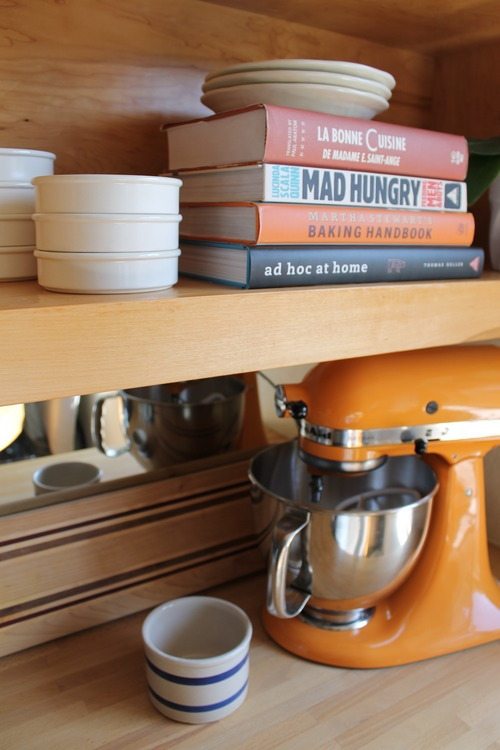 Rachel’s officially coveting the tangerine Kitchen Aid stand mixer. 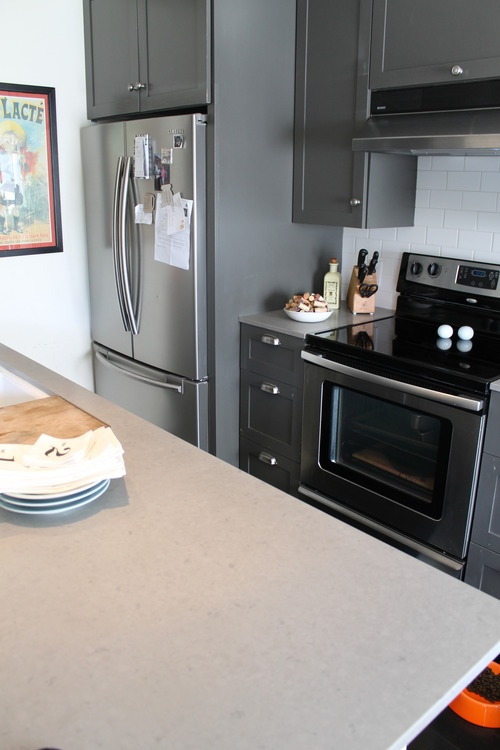 A view into the kitchen reveals dark gray painted cabinets and light counter tops. More kitchen collectibles and color-coded cookbooks stacked horizontally. 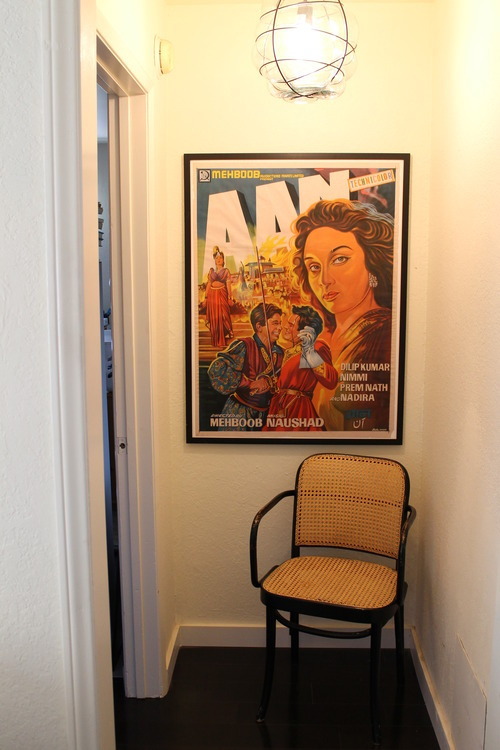 A vintage French poster brightens a spot next to the fridge. 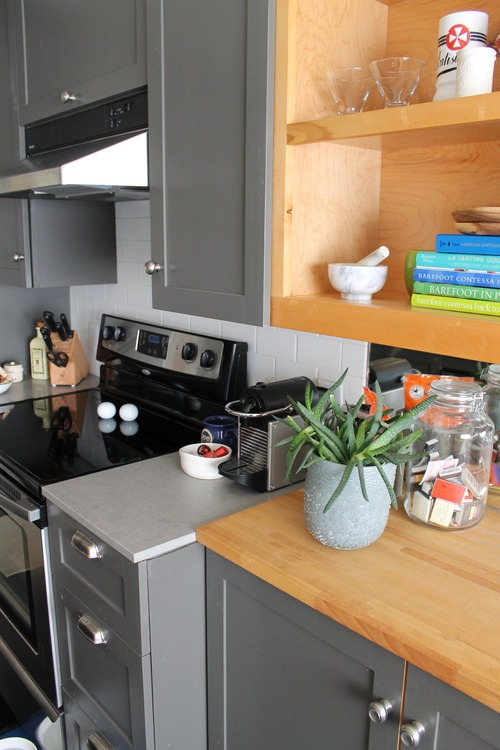 Our kind of kitchen — with plenty of open shelving for adding color, style and functionality. 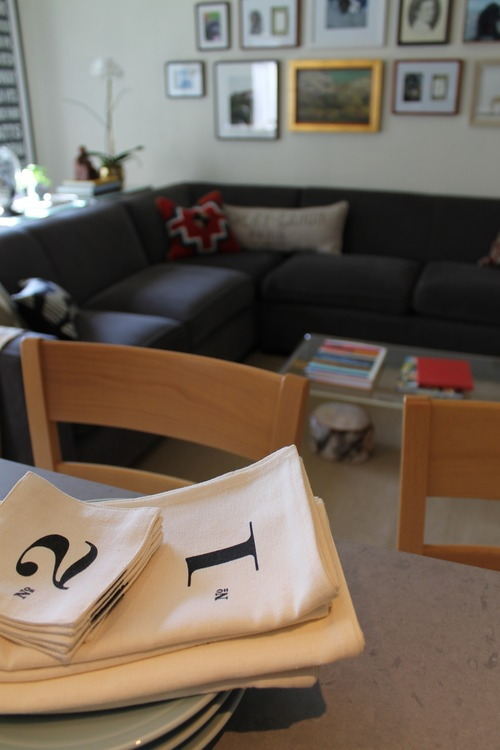 Numbered linen napkins in a stack. 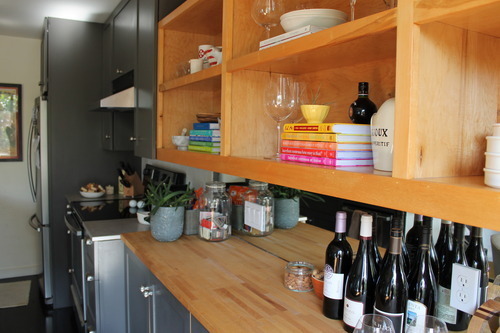 Some of our favorite cookbook authors are represented on these shelves. 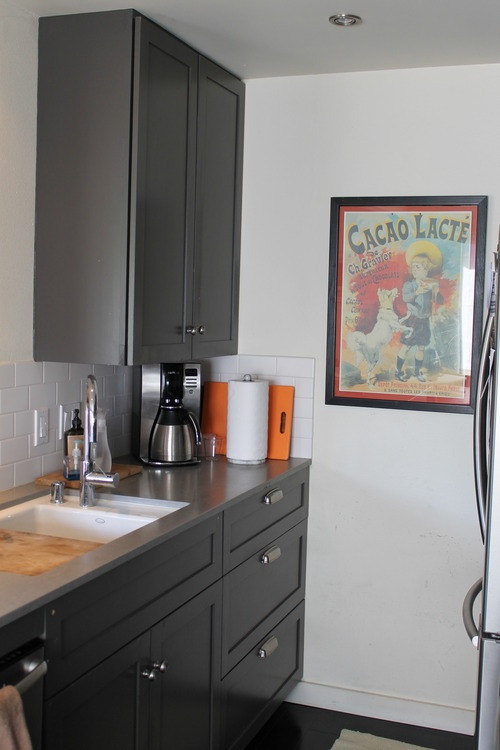 This is a kitchen for people who love to cook and entertain, evident in every well-stocked detail. 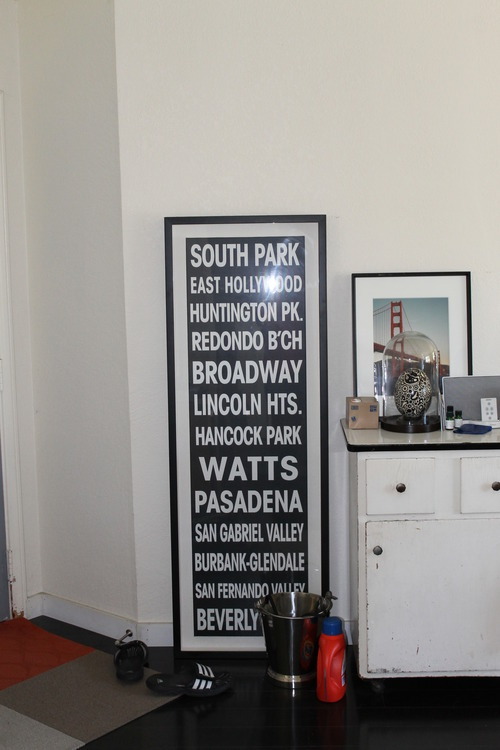 A reproduction subway roll sign highlights several familiar Los Angeles-area cities.